The Protagonist: Willow Chance. A 12-year-old genius who loves cataloguing plants and medical disorders. Her Angst: When her parents are killed, she loses her direction and doesn't know how to regain her zest for life and discovery. Dell Duke: Willow's incompetent, sad sack school counsellor. He initially hopes to use Willow's genius to make himself look better, but after she's orphaned, he finds himself (somewhat unwillingly) roped into looking after her. Quang-Ha: Another patient of Dell's - a rebellious and angry teenage boy who lives in a one-room garage with his mother and sister. Mai: Quang-Ha's determined, take-no-prisoners sister - and Willow's newest best friend. Pattie: Quang-Ha and Mai's mother who runs a nail salon, and believes that certain colours are luckier than others. Jairo: A lonely, unfulfilled cab driver who's inspired by Willow's excitement and curiosity. The Word: Willow Chance is weird. She has a genius-level IQ. She has a prodigious memory for details (particularly numbers, scientific concepts, and medical disorders). She is a person of colour with white adoptive parents. She's obsessed with the number 7, afraid of germs, and cultivates several rare plants in her enormous jungle of a garden in her parents' yard. She doesn't have too many friends. And when she's twelve years old, her parents die - suddenly, horribly - and Willow is left alone. Although grief shocks Willow out of her weird behaviours and into a kind of numb paralysis where she doesn't care whether things are arranged by sevens or not, the weirdness manifests itself in the people around her instead - the outcasts and oddballs and misfits who take Willow in, and discover that all their jagged, mismatched pieces fit together in an oddly harmonious, yet utterly unique way. The novel rests on a solid foundation of well-drawn characters - before she became an orphan, Willow lived her life exactly as she saw fit. She never hid her desires or her ambitions or her feelings from anyone, and her vivacious, information-hungry presence initially unnerves the supporting characters - like her counselor, Dell, or the other kids receiving counceling, Mai and Quang-Ha. When her overwhelming grief saps this life-force from Willow, the seemingly-random people around her who have hidden their strangenesses and their impossible dreams and their secret talents away (often for years), find themselves blooming in her presence, as their strange gifts turn out to be just what Willow needs to help move on from her tragedy. Counting By 7s is weird - and also a celebration of the weirdness that everyone has the potential for. The main thing I noticed about Counting By 7s was how balanced a read it was. The novel dances between the absurd and the realistic, exaggeratedly comic scenarios and intimate moments of emotional poignancy, deus ex machina developments and plot points that expand outward from pre-established circumstances. And all in an extremely organic, tempered tone throughout the novel. It takes an incredibly deft hand to make all these disparate elements fit together using an array of different viewpoints without coming across as contrived or cutesy. That being said, there were a few problems with the ending that gave me pause. I get that they were meant to fit into the absurdist aspect of the novel, but without an actual explanation the development made little sense. 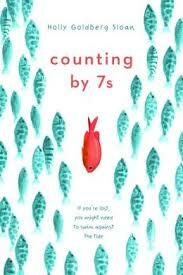 Counting By 7s is a sweet, swift read - but a profound and profoundly enjoyable one, for all that.